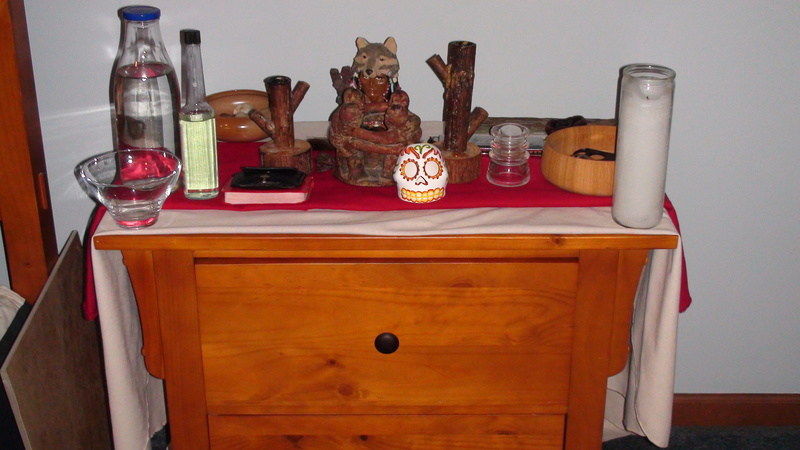 Continuing the series of posts on altars and shrines, we come to how our shrines look like now, just before Yule. The altars and shrines are more than just a place to leave offerings; these are places where we can devote ourselves wholly and fully to worship, to good relationships. In my own case I am doing my best to make sure I spend at least 10 minutes a day with my Ancestors. Much of the family’s altar and shrine times are when we pray. Our lives are hectic, and our schedules are up and down. In my own case I work midnight shifts and Sylverleaf morning and evening shifts, and our son goes to school. These altars and shrines give us places, even for a few moments, to slow down, remember our blessings, pray, and give offerings for all we have. These altars and shrines, as I have mentioned, change throughout the year. Much of the decorations, and the altars and shrines themselves were gifts or bought from thrift stores and garage sales. The cloths come from our local JoAnn Fabrics when we cannot find the right colors/patterns in thrift stores. There’s nothing saying you cannot buy good/expensive things for your altars or shrines any more than cheap. We take care in selecting what goes on our altars and shrines, regardless of where it comes from. We listen to the Gods, Ancestors, and spirits for what They want on our altars and shrines, what offerings They want, and so on. What matters, in the end, is the care you put into crafting your altars and shrines. What also matters is the prep work done before making an altar or shrine, and/or when transitioning between set up and take down. When we make a new shrine we first clean the area, vacuuming, dusting, the works. We then will clean the shrine inside (if there is an inside) and out physically with water and soap, if needed. We will then cleanse the altar or shrine with blessed water and/or Florida Water, and may use this water in lieu of soap and water, using fresh towels when needed. 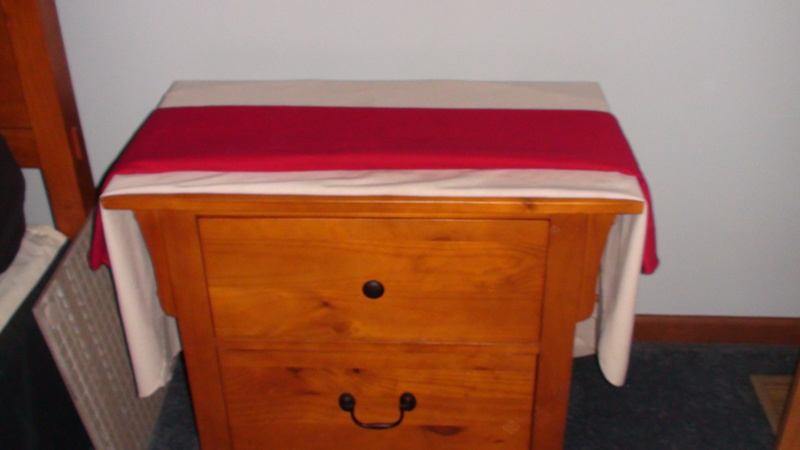 Whenever we transition the altars and shrines, we clean all their cloths. We also clean any new cloths prior to their use. While those are in the washer and then dryer, we will clean every piece of the altars and shrines that we can, bathing the statues, if we can, and scrubbing everything that can be scrubbed clean with fresh towels. 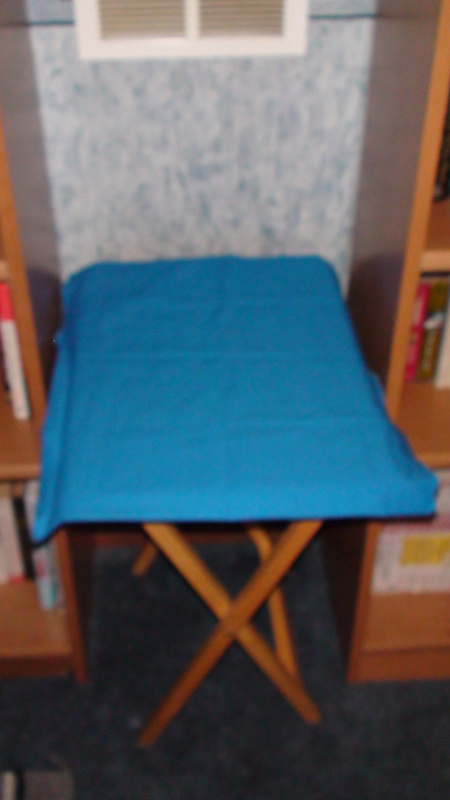 We then dry with fresh towels, and they usually wait on my bed until the cloths are ready. 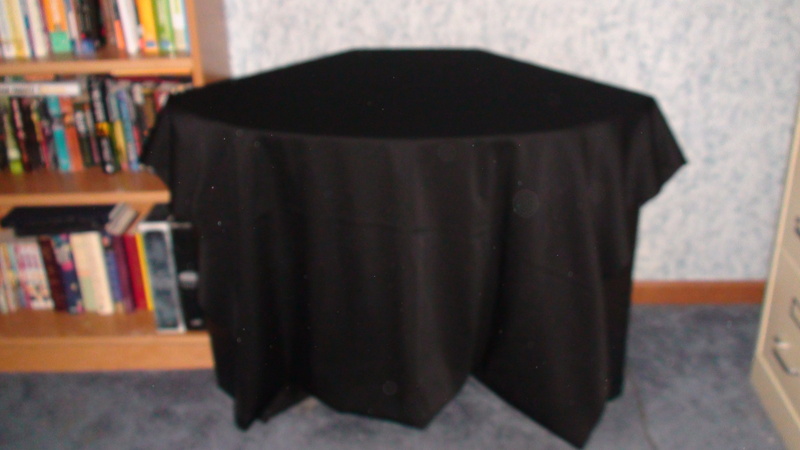 When the cloths are ready and we have all the items we need for the shrine, we will take some time and ask the Gods, Ancestors, and/or spirits for whom the altar/shrine will be made, what color altar cloth They would like. We usually do this well ahead of time for new shrines, but with transitions between seasons and/or cleanings, we will not know until we the cloths are clean. When we have an answer, or if we are left by Them to suss that out, we will lay the selected cloth on the surface and adjust until it looks/feels right. Then we decorate the altar, first with the direct representations of the altar or shrine itself, such as the Gods for the Gods’ altar, the Ancestor for Their shrine, and so on. We generally start in the middle and work our way out, so the main Gods with whom we work are in the center of the altar and those who we give honor to are on the outside. This does not always follow, though, as sometimes Gods we have had long relationships with, such as Sunna and Mani below, end up outside of the granite tile and on one of the sides of the Gods’ altar. At this time of year since our families are coming together we put our Gods together on the Gods’ altar by families wherever we could. 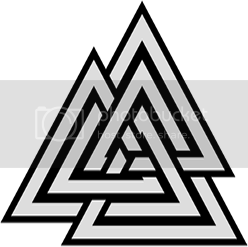 So Odin and Frigga are together, Brigid and Bres, Mani and Sunna, Freyr, and Freya, and so on. 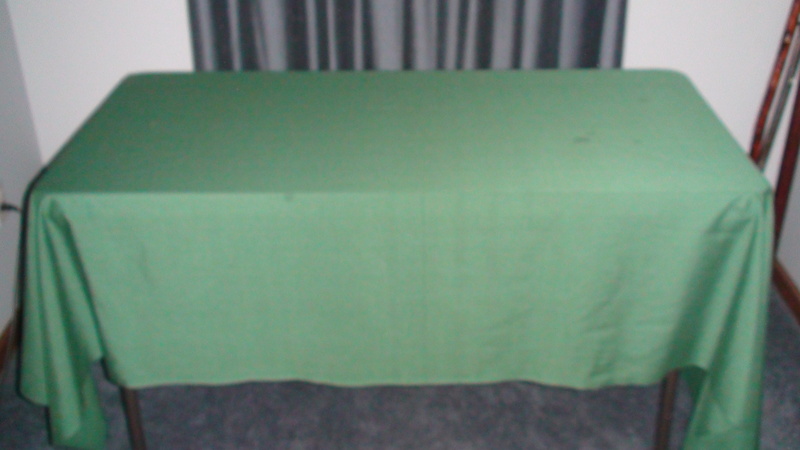 The green altar cloth was laid down in reflection of the evergreens. The Gods our family actively worships are in the center, with many Gods whom we have connections to have prayer cards, such as Sekhmet and Hermes below the two paintings of the Valkyries. On the opposite side is a sword I received at this last year’s Renfaire from a Michigan-based blacksmith. The glass crystal chalice was a gift from a dear friend, someone I count as a Sister. In the corner are my journey staff, a sword I’ve had for about 7 years I used in evocation work, and a spear I received as a gift from a dear, old friend for work I did with him. 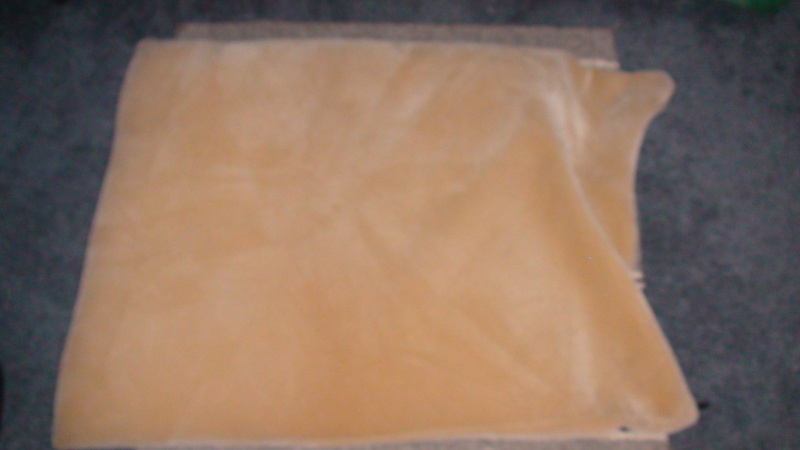 The Prayer Pillow for the Gods’ Altar Yule 2013. 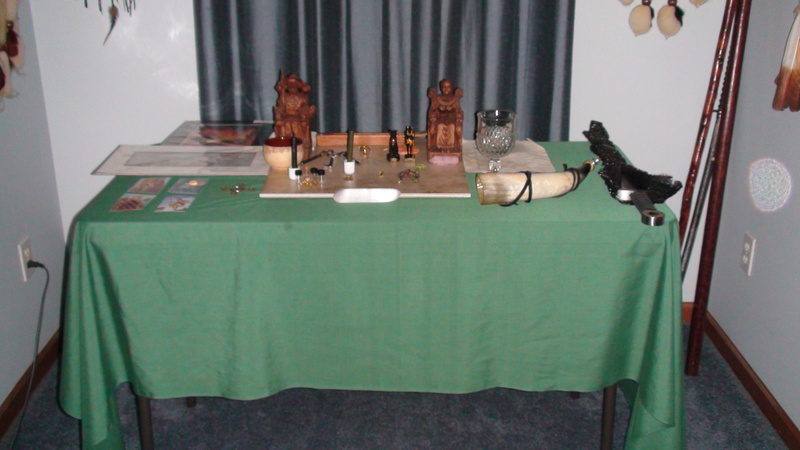 The Gods’ Altar for Yule 2013. 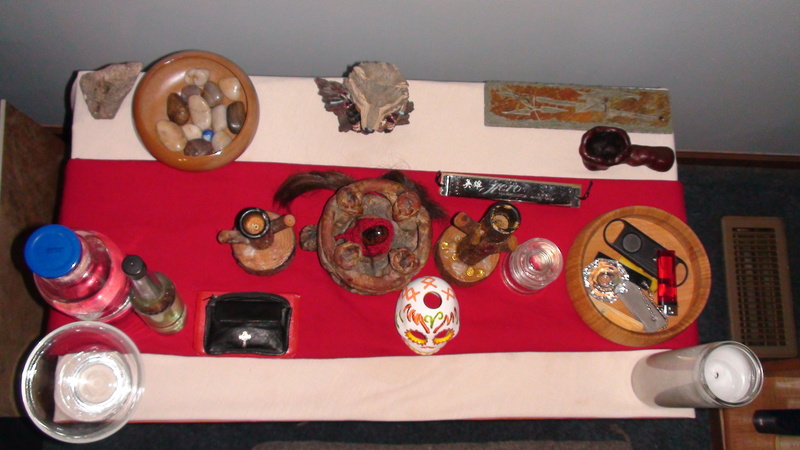 The left side of the Gods’ Altar Yule 2013. On top are the two Valkyries. 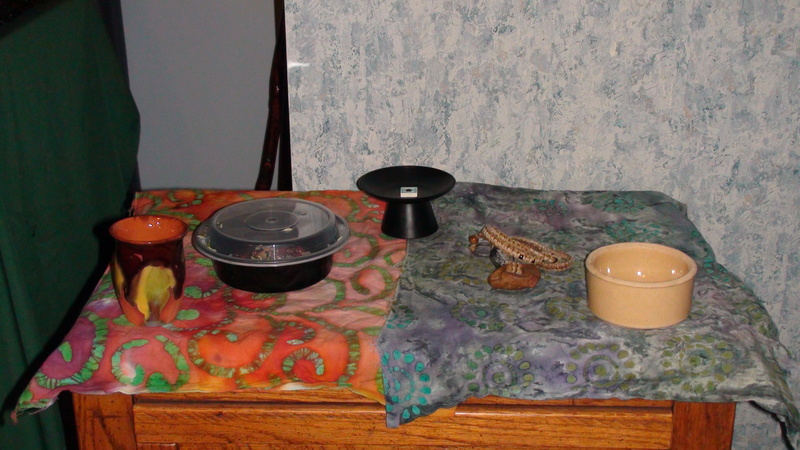 To Their left are Odin with His offering bowl. To His Right are Frigga’s Keys. Below the Keys are two Brigid’s Crosses representing Brigid and Bres. To Their right is Mjolnir, Thor’s Hammer. 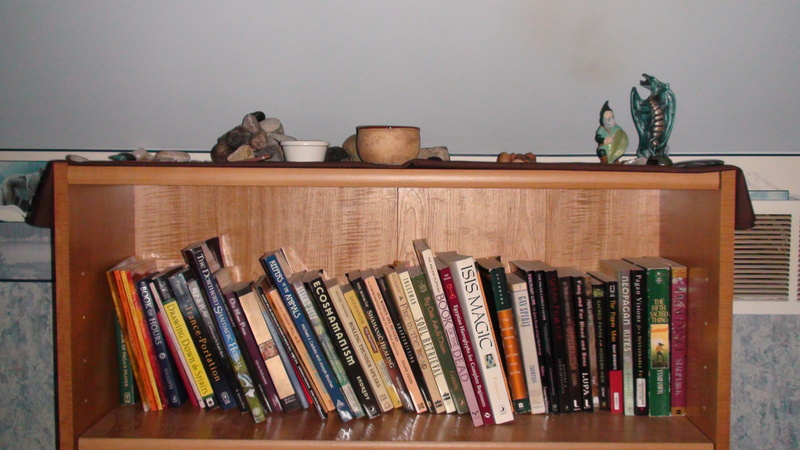 Two of the four prayer cards are Sekhmet’s, Mani and Hermes prayer cards are to the right beside Them. Sunna’s symbols, a golden coin surrounded by four metal suns, are placed next to Her Brother Mani. 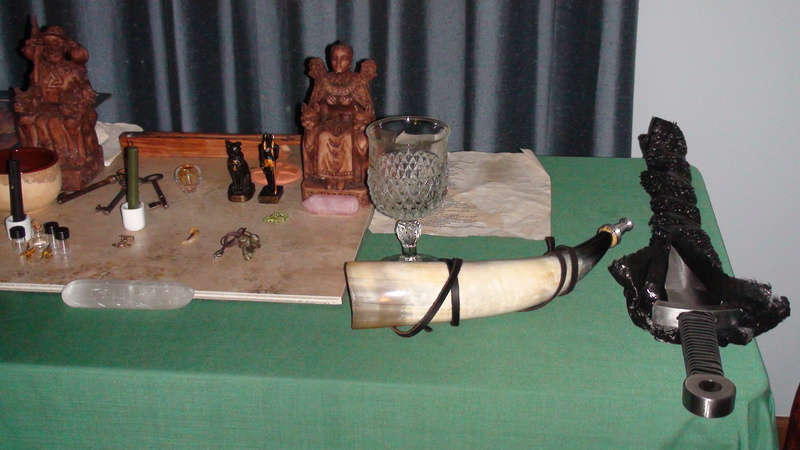 Right side of the Gods’ Altar Yule 2013. A sword, whose use and study I dedicate to Odin, is waiting for its scabbard. 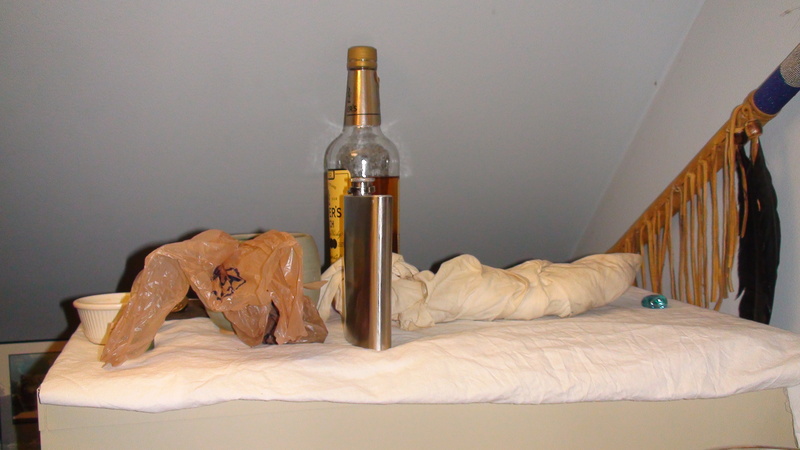 To its left is the drinking horn. 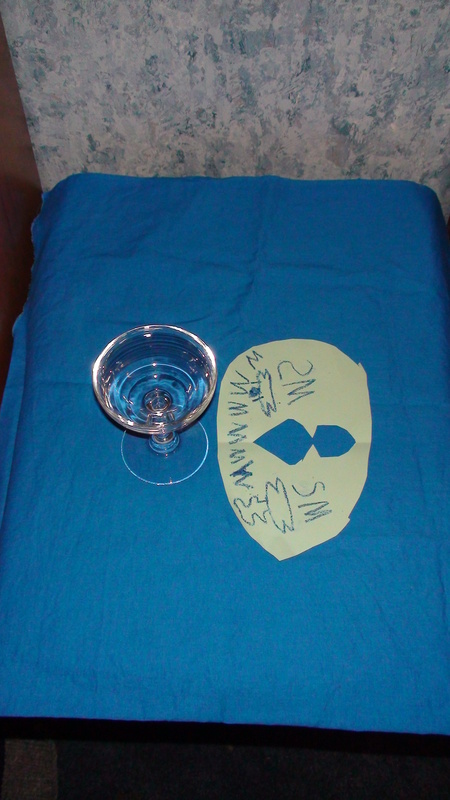 Behind the offering chalice is the Negative Confession. To the left is Freya. Left of Her is Bast and Anubis. Before Them is Freyr as the Green Man. The Earth Goddess represent Nerthus and Jord on this altar. This shrine is relatively new. 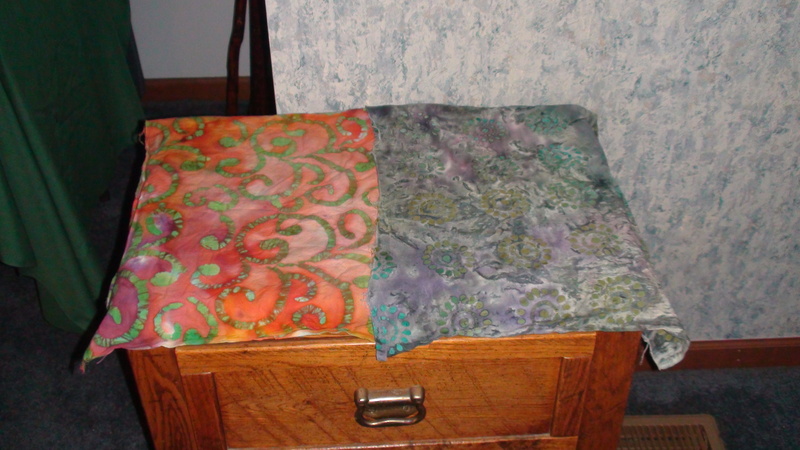 This was made in the Fall after we picked up the table at a garage sale, and the batik patterned cloths at JoAnn Fabrics. The batik patterns struck us as being perfect for each set of powerful Ancestors. 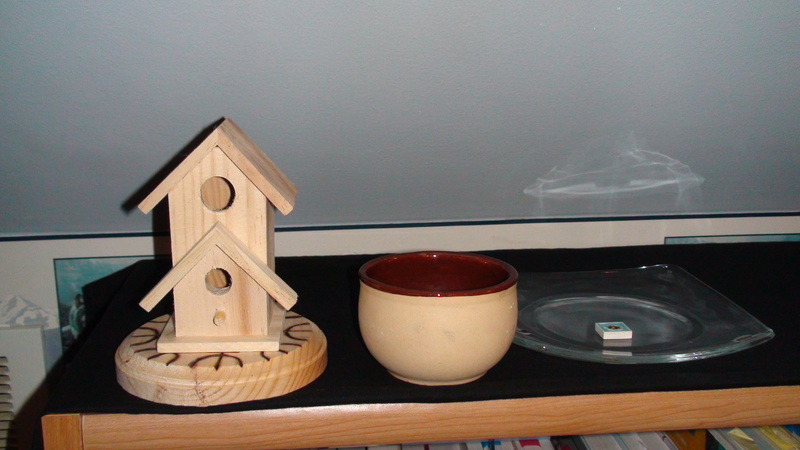 The two ceramic pieces we picked up at our local thrift store. The left part of the shrine is for the Disir, and the right, for the Väter. The plastic container has my necklace for the Disir, bought from an excellent craftsperson at ConVocation, which broken recently. The necklace on the left was made by a good friend of mine, made while she meditated on all the men who had an impact on her spirituality. Disir’s and Väter’s Yule 2013 shrine pre-decoration. Disir’s and Väter’s Yule 2013 shrine. The Elemental Ancestors have spaced out a bit since the last time I took photos. They now are part of the four pillars of the shrine. Sometimes the Elements switch places entirely. At one point Earth and Air were in the front of the altar, and now They are in the back. This is reflective of the relationships we have with the Elements as with the seasons we are in. Earth and Air were in the front through the Summer, if memory serves, and come Fall we transitioned to the layout we have now. This new layout brought with it important additions to the shrine. 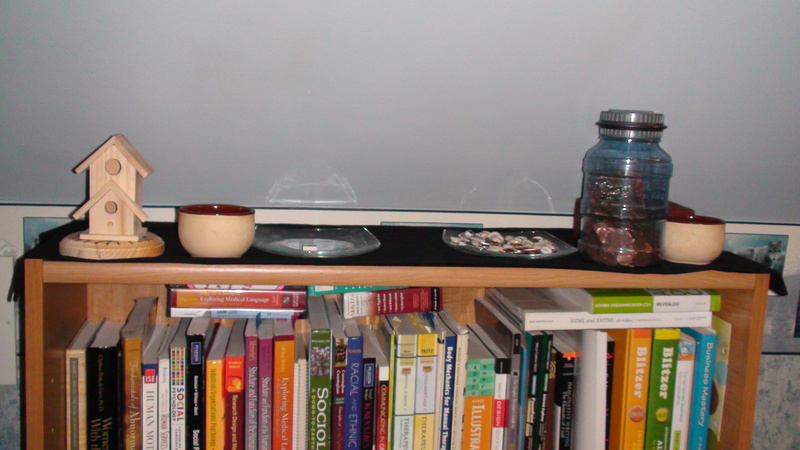 The first that was placed on the shrine is the glass insulator my Brother gave to me. 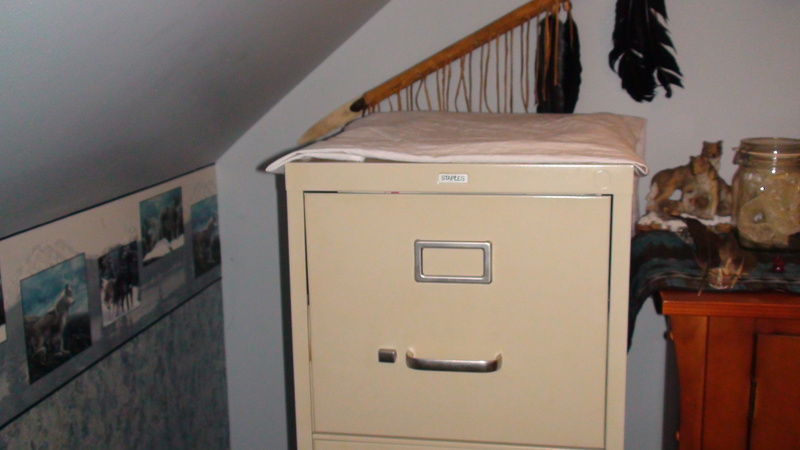 It belonged to his grandmother, and now sits prominently on the shrine. As with adoption, when I call someone Brother or Sister, and am called a Brother in return, our Ancestors mingle and become part of one another’s lives, part of our family as surely as we are. With my adoption into the Thunderbird People I placed the Native American bust in the back, given to me a long while ago by my Mom, on the shrine. Given my own tribemates have similar statuary, one on their own Ancestor shrine, I felt it was about time I did so too. Ancestor Shrine Yule 2013 pre-decoration. Ancestor Shrine Yule 2013 Top-down view. The Earthvaettir Shrine has changed quite a bit. Ramses II is now on the Warrior Dead shrine, per His request. The shrine has new offering bowls, part of a set we bought from the local thrift store to replace the bronze ones. While the bronze bowls would work for dry offerings, they got weird and green with liquid offerings, so we have switched them out for the time being. The shrine to the Roadside Dead, which has been part of the Earthvaettir shrine for a while now, has a more prominent place. 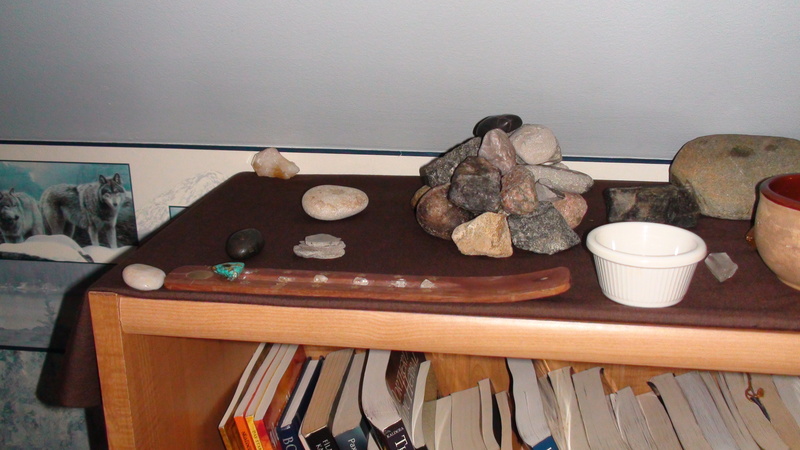 A moonstone sits at the feet of its incense holder, which our son made. At its top sits the offering bowl. Behind it is the cairn, which, as mentioned in the last post, changes position and structure each time the Earthvaettir shrine is cleaned and remade. 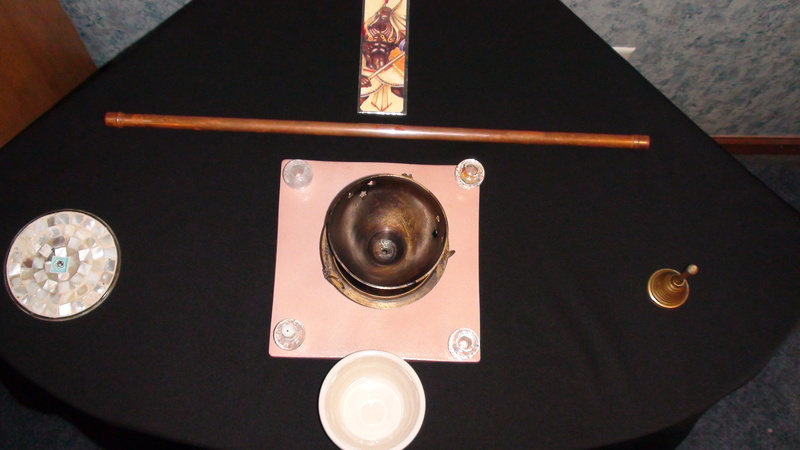 In the center of the shrine behind the ceramic offering bowl is the Gebo stone on the left, the Earthvaettir stone on the right, and the large stone in the back is the Landvaettir’s stone. 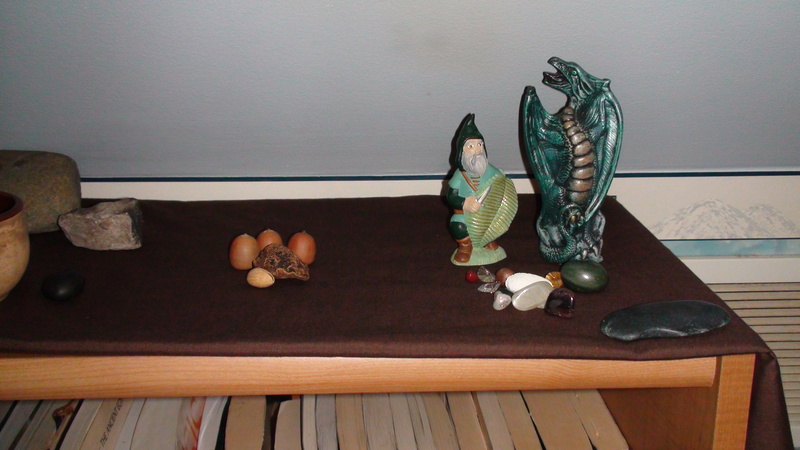 On the right the Gnome and Dragon of Earth have more prominence, and before Them are the stone we have used in magical work and healing over the years. At each of the four corners are stones, which change between them and other stones when the shrine is remade, symbolizing the four directions and the Four Dwarves who hold up the sky. The Earthvaettir Shrine Yule 2013 Pre-decoration. Long shot of the Earthvaettir Shrine Yule 2013. Left side of the Earthvaettir Shrine Yule 2013. Right side of the Earthvaettir Shrine Yule 2013. This is the newest shrine. 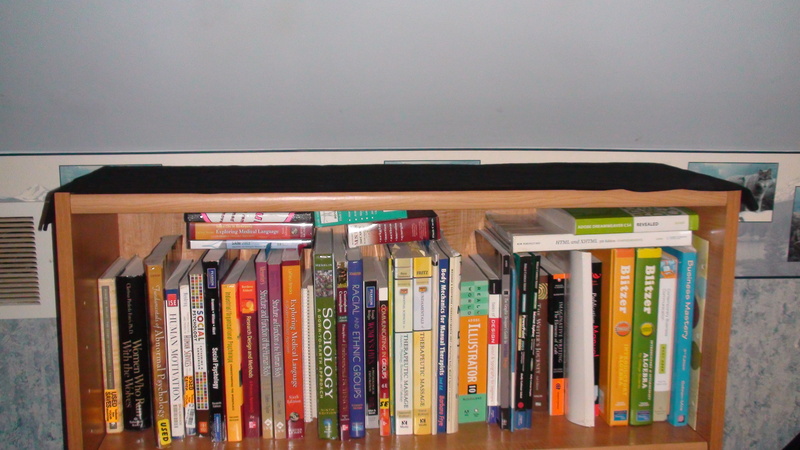 The table is a temporary one, given it is a wooden TV table and likes to wobble. 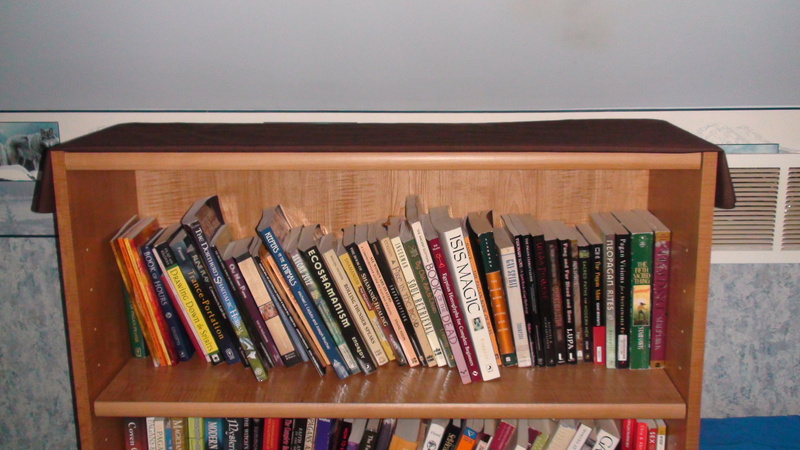 It sits between the two bookshelves on which the Earthvaettir, Housevaettir, and Moneyvaettir shrines sit. This was almost exclusively made by our son; he insisted we make it one day, and all we did was buy the cloth and gave him a choice of containers for offerings. The paper image he made at school, and while he has not explained to us what it is, he made it with a friend and told us “It is for the water spirits.” While he is involved almost every time we clean and set up altars and shrines, this is the first he has made by himself. We are very proud of him. The Watervaettir Shrine Yule 2013 pre-decoration. The Watervaettir Shrine Yule 2013. These two shrines have not changed much at all. The Housevaettir now rests atop a woodburnt Ægishjálmur that I made here at home. The Moneyvaettir Shrine has more shell and coins added to it, and some taken from it. The coin jar has sheaves of coin holders in it, with the idea of ‘we hope to fill these’ and ‘we have a place for you’ in mind. 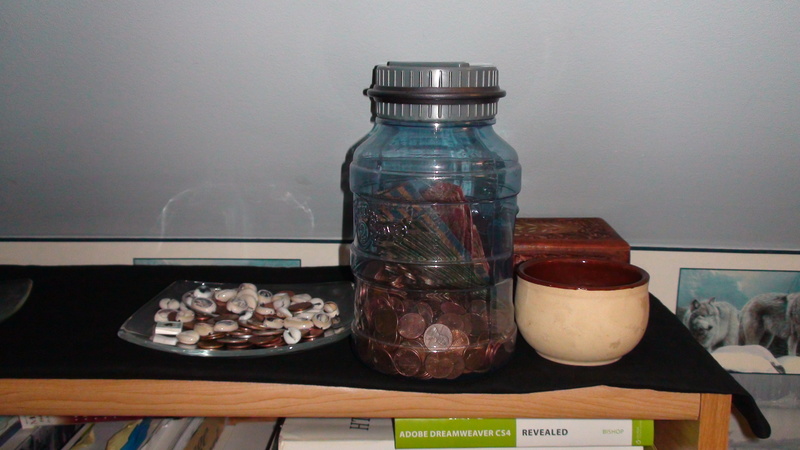 There was a point in the Fall where we emptied the coin jar of a good deal of coins to help pay for things. That adding and taking from the coins is part of a good relationship with Moneyvaettir; sometimes you have a lot and sometimes you do not. Every time we’ve needed coins on hand They have been there for us. Housevaettir and Moneyvaettir Shrine Yule 2013 pre-decoration. Long view of the Housevaettir and Moneyvaettir Yule 2013. Left side of the Housevaettir and Moneyvaettir Yule 2013. 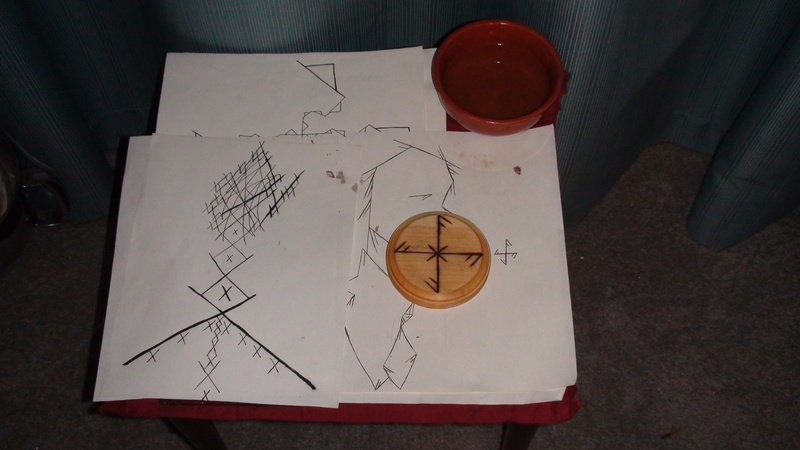 Right side of the Housevaettir and Moneyvaettir Yule 2013. 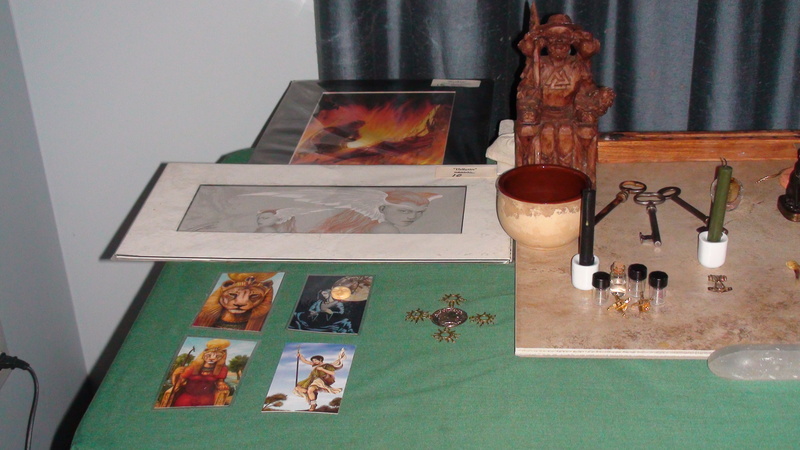 This is a shrine that I set up this year as a priest of Anpu. My work with the Dead as His priest had a long break, about 4 years. When I started to do prayers for the Ancestors of my House, House Sankofa, I also felt called back to offerings prayers for the Dead, especially the lost Dead. I was pushed by Anpu to go back to the work of helping lost Dead and whoever comes to the shrine cross to where They need to go, with His help. The shrine has four candle holders around a censer in the middle. The four fires are there to cast light and warmth to the four directions, inviting the Dead, and the censer as a gathering place where They can smell the sweet fragrances and be comforted by the frankincense, myrrh, and other offerings left there. Anpu’s image is above His wand, which I use for Opening and Closing the Door every Sunday in the work. There is a bowl of water below the censer to quench the Dead’s thirst, and a place for more incense and other offerings to the left. On the right is a bell that I use in the weekly work to soothe the Dead, and call to those who wander. The Dead Shrine Yule 2013 pre-decoration. Long view of The Dead Altar Yule 2013. Top-down view of The Dead Altar Yule 2013. The Warrior Dead Shrine now has Ramses II on it in the back of the shrine with a stone star above His head. 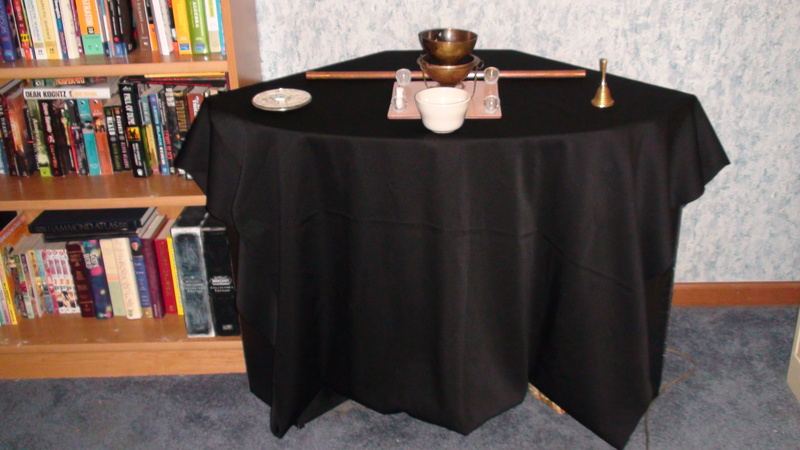 The altar cloth is now white, and the placement of its items have been switched around a bit. 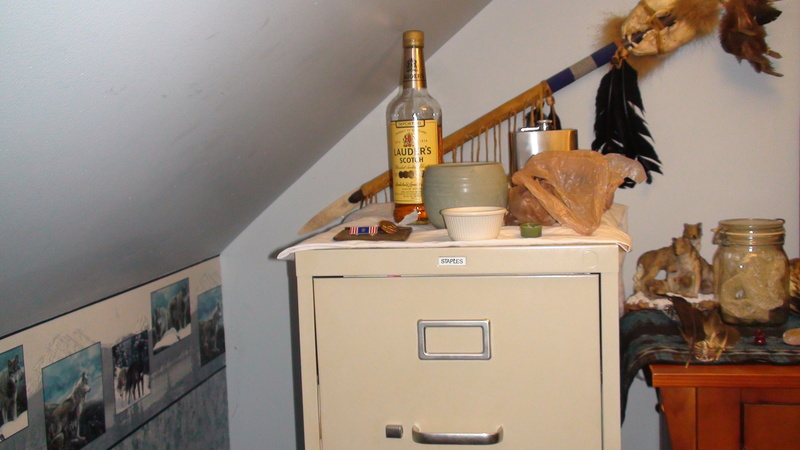 The last of the Ezra Brook is now in the flask, and the offering liquor is now Lauder’s Blended Scotch Whiskey. The formerly white ceramic offering bowl now is stained with the offerings I have given despite my best attempts to get it back to white. Given the candle-pot was both unwieldy and I could not light a candle in it, it was moved off of the altar. The Warrior Dead did not seem all that attached to it, as it was. The shrine is closer together and simpler, but feels better overall, and Ramses II has settled in well here. The Warrior Shrine Yule 2013 pre-decoration. The Warrior Shrine Yule 2013. Side view of The Warrior Shrine Yule 2013. Only the placement of things has changed on this shrine, but I thought it would be good for people to see how things can change even on altars that don’t change all that much throughout the year. 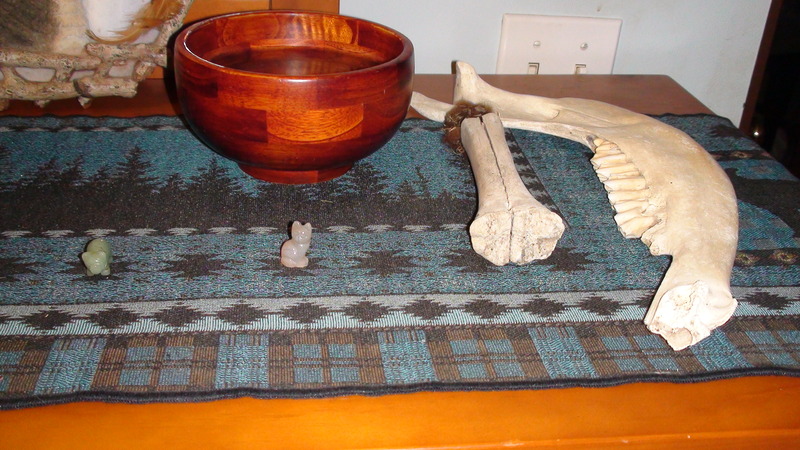 Aside from dusting on occasion, and cleaning Them as needed, the animal spirits prefer I not change out the altar cloth. Long view of the Animal Spirits’ Altar Yule 2013. Left view of Animal Spirits Shrine Yule 2013. The left bone on the far right and the horns are a male buffalo nose bone. To the right of the nose bone is a deer leg bone. The black stone has a seal in it. To its left is Turtle, Dragon, and Snake stone sculptures. 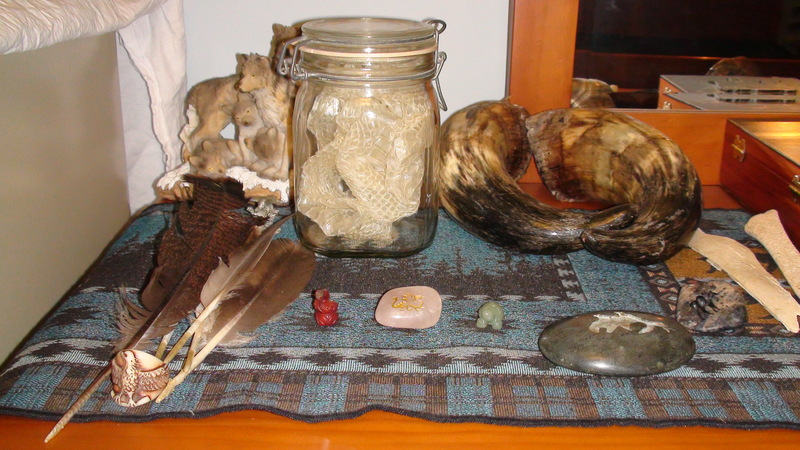 The snake skin in the jar is a gift from good friends. The eagle bone ring and feathers both were gifts from good friends. Center of the Animal Spirits Shrine Yule 2013. 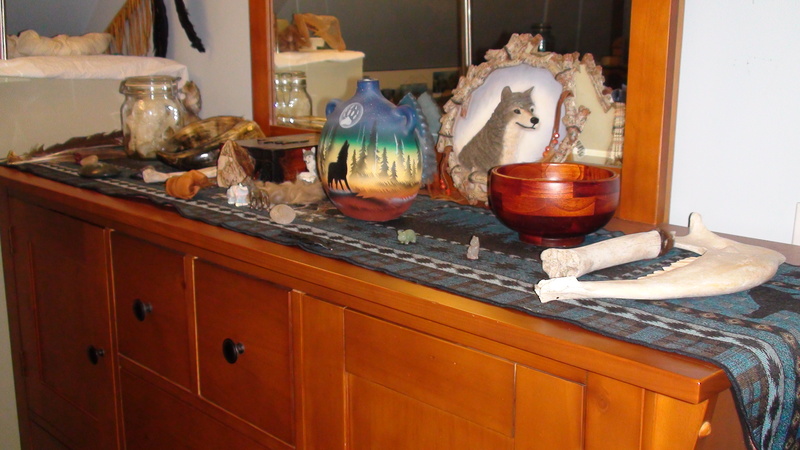 All of the statuary were gifts from my Mom, the wolf fur and bones from Shin Cynikos, and the mushroom from a former girlfriend. The Raven stone I bought from Earthlore in Plymouth, MI. 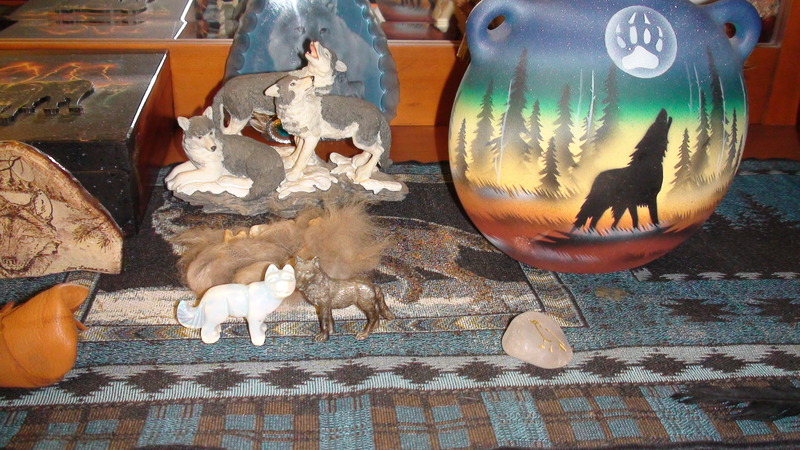 Right side of the Animal Spirits Shrine Yule 2013. The rightmost bones and fur are from male buffalo from the Wild Winds Buffalo Preserve. The two stone animals are a cat and pig, sacred animals to our Gods, and as spirits Themselves. The Runevaettir altar has not changed all that much. It now has many Rune mandalas made with ink on paper, and holds the communion talisman, one of two I made for the 30 Days of Magic Talisman Challenge put on by Andrieh Vitimus. The offering bowl now is in the back left corner where it can sit without blocking the mandalas when I use them or make another. Come the Spring I will need to take photos and write about shrines we keep outside, since at least one of them cannot be seen well right now. These shrines include the shrine to Hela and Niðhogg, the Landvaettir’s outdoor shrine, and the Air spirits.